The multiple source query plugin allows SQuirreL users to create a virtual data view that has multiple data sources on different servers and platforms and use SQL queries to join, compare, analyze, and move data between systems. Cross-database queries built in SQuirreL can be easily moved to any reporting or Java-based software allowing access to multiple databases simultaneously from outside SQuirreL. Why spend money on costly analytics software when you can get your query results easier? Why invest in costly server infrastructure when virtualization can be done in minutes at minimal cost? Why try to learn each SQL dialect when translation can be done automatically? Install the open source multisource plugin from the SQuirreL installer or download it here. 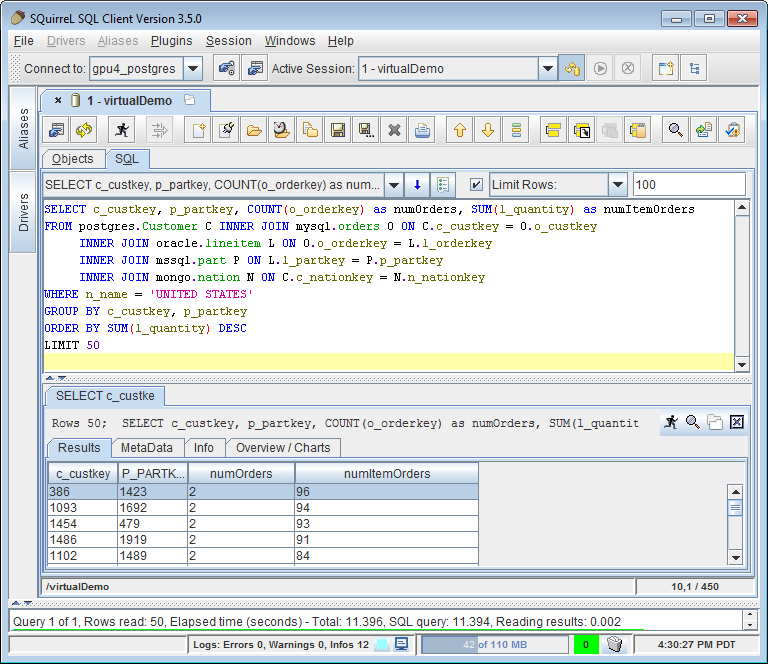 SQuirreL with the multisource plugin allows distributed, federated, and virtualized SQL queries in seconds.